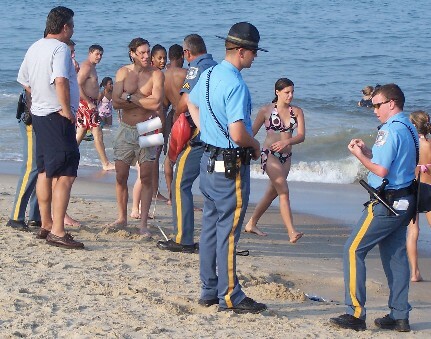 Early detection, bystander CPR, rapid response and early defibrillation are credited with saving the life of a Pennsylvania man who suffered a suspected heart attack after lunch on Rehoboth's beach last Thursday. Sussex County EMS Special Operations Coordinator, Tim Cooper, said the two EMTs working for the Rehoboth Beach Patrol found the 55-year-old man around 12:50 p.m. in front of Obie's by the Sea. He was unconscious, not breathing and had no pulse -- on the verge of almost certain death. A bystander had already started CPR, but the man remained pulse-less until the EMTs shocked the victim once with a LIFEPAK 500 automated external defibrillator (shown in the picture above in the black case). Miraculously, after receiving a single shock from the AED, the man, who had been on the verge of death, almost instantly regained consciousness and began speaking. 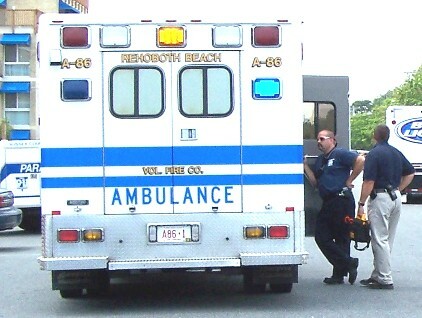 He was loaded in the Rehoboth Beach ambulance (shown above) and taken to Beebe Hospital in critical condition. One of the two EMTs is actually off-duty Sussex County paramedic Lars Granholm, who had been working part-time for the Rehoboth Beach Patrol on Thursday. Granholm is also the county EMS's bicycle mechanic. Stephanie Callaway, Sussex County EMS spokeswoman, said Sunday that the last she heard the man was still in critical condition when he was flown from Beebe Hospital to Christiana for cardiac care. 3 MORE VEHICLES TOWED FROM STOCKLEY STREET LIFEGUARD PARKING! Police ticketed and towed three more unauthorized vehicles from the same lifeguard parking space on Stockley Street this past week. In one case, a woman walking by expressed concern to the officers that she thought it was unclear that the sign actually applies to both parking spaces. This has been a common complaint for the past three years. Last season, police were called at least nine times to have vehicles ticketed and towed from this same parking space on Stockley Street. 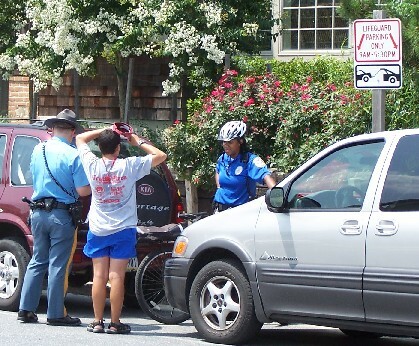 The beach patrol has called police at least seven times this month alone for unauthorized vehicles in this same spot. The confusion seems to stem from the LIFEGUARD PARKING ONLY sign which is 24 inches to the right of the painted line which divides the two reserved parking spaces. The sign slants slightly toward the beach, and both arrows point downward. The most recent tow request for Stockley Street was around 1:30 p.m. Saturday. Two officers and a junior lifeguard guarded this maroon Kia Sportage with Pennsylvania tags (below) for about 35 minutes until Coastal Towing pried it from its parking space. 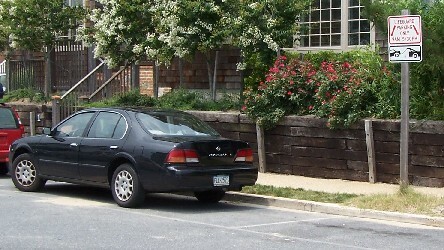 Coastal Towing also pulled this black Nissan Maxima (below) from the same parking space at 1:35 p.m. on Thursday. Two officers remained with the Maxima for 40 minutes until it was finally towed. Note the picture on the left which shows the sign and its proximity to the line painted between the two spaces. On Wednesday, two officers were assigned to watch this Hyundai Sonata with Maryland tags (below) for about 35 minutes until it was removed by Blue Hen Towing at 3:10 p.m. When the officer asked the dispatcher if it were supposed to be towed or simply ticketed, the reply was "Any time it's in a lifeguard spot, we have to tow." On Sunday, a burgundy Nissan Altima with temporary tags (below) was removed from the reserved lifeguard parking space on Saint Lawrence Street. It was at least the third vehicle to be removed this month from this reserved parking space, making it second to the Stockley Street space as far as total tows for July. Like Stockley Street, the sign reserving the two spaces is erected 17 inches to the right of the dividing line. This sign is closer to the center line than the one on Stockley Street. 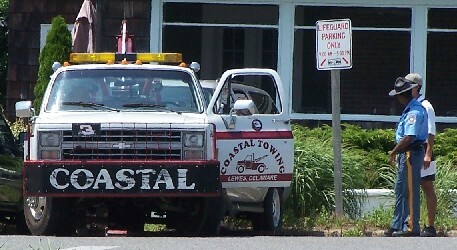 Two officers remained with the car for about 30 minutes until Coastal Towing removed it at 1:10 p.m. The only other vehicle towed from lifeguard parking this past week during lunch hours was a silver Chevy Suburban with Pennsylvania temporary tags (below). It was discovered parked backwards in the lifeguard parking space on Pennsylvania Avenue on Wednesday. 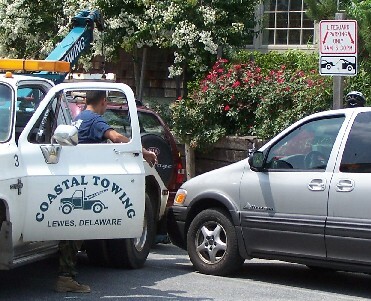 An officer accompanied by a community service officer watched the vehicle for about 45 minutes until Coastal Towing took it to the city's impound around 1:55 p.m.
Sheilagh Soules (above in green dress) and Pat Noble (not shown) distributed LaRouche P*A*C materials in front of the Rehoboth Beach Post Office Tuesday afternoon. Police were dispatched to investigate a call for "protesters" around 12:30 p.m.
Officers discussed the matter at length over the radio, including quoting from the city ordinance book. Ultimately, police asked Noble to go to city hall to determine if they needed a permit from the city manager. Three officers and a patrol car remained with Soules while Noble spoke with city officials. The women said they were only in town for the day. 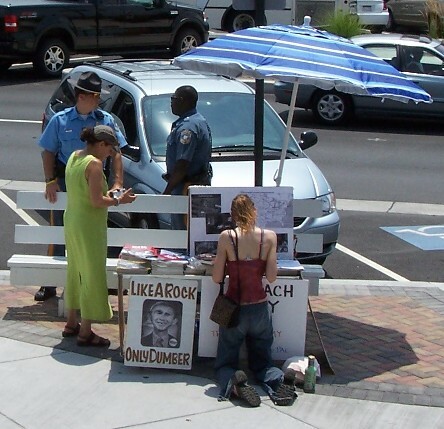 After about 30 minutes, one of the officers radioed the others that the decision was made to allow them to remain as long as they did not impede the flow of pedestrians, collect money, or force literature on people. Soules says they picked the post office because Ben Franklin considered it the town center where people met to exchange ideas. 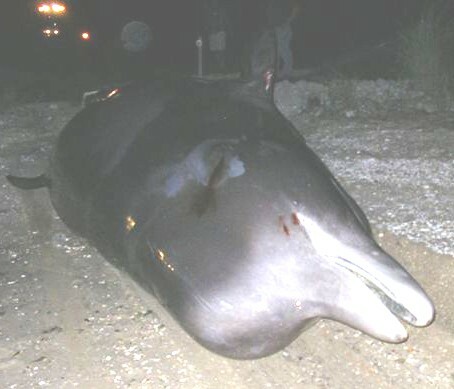 Cape Henlopen State Park rangers spotted this dead Bottlenose whale Saturday afternoon on the ocean side about 300 yards off Herring Point. It took more than three hours for the Coast Guard and members of the Marine Education, Research & Rehabilitation Institute to tow the remains to the University of Delaware at Roosevelt Inlet in Lewes for a necropsy. Walter Palmer, a volunteer member of the MERR rescue team, said he received a call from Suzanne Thurman, MERR director, around 6 p.m. Saturday to prepare to receive the 26-foot female at a beach just inside Roosevelt Inlet. A marine biology team was summoned from Shepherdstown, WV. A team of 16, including nine members from MERR, three from Coast Guard Station Cape May, two from DNREC, and two marine biologists landed the remains around 8:30 p.m.
An examination of the whale's body revealed no unusual conditions, Mr. Palmer said. A full autopsy was performed on-site with no remarkable results other than contents of the stomach which included the top of a plastic spray paint can. It is not believed to be the primary cause of death. Autopsy specimens were taken to the lab for further study. The operation concluded around 5 a.m. Sunday. Mr. Palmer said this whale is not indigenous to the mid-Atlantic region, but rather cold water climates from Nova Scotia to the Arctic Circle. On Wednesday, July 26, the Coast Guard was among several agencies which responded to the strandings of two whales, one reported as a pilot whale, off Sea Isle City, NJ. The speculation is that the dead whale and a smaller one spotted this past weekend still alive in the Beach Plum Island, Prime Hook, and Broadkill areas of the Delaware Bay, could be its calf. As an odd coincidence, the crew of the Pilot Boat Brandywine found an unidentified mass suspected to be a whale attached to the hull of the motor vessel Independent Endeavor when the pilot attempted to board the ship off Cape Henlopen on June 4. It took about 20 minutes to dislodge the remains from the 167-meter Liberian-flagged cargo ship. The remains sank immediately once removed from the ship's hull. NOAA's Miri Skoriak provided this description of the pelagic (open ocean) mammals survey being conducted by the NOAA research vessel Gordon Hunter this past week off the Delmarva coast. U.S. Atlantic waters along the shelf break from the South Carolina/North Carolina border (approximately 33N latitude) to southern New Jersey (approximately 40N latitude). 1. Conduct broadscale visual and acoustics surveys of the shelf break region of the mid-Atlantic to quantify marine mammal abundance and spatial distribution. 2. Conduct fine-scale surveys to evaluate the relationship between marine mammal distribution and mesoscale hydrographic features. 3. Collect hydrographic profiles, plankton samples, EK60 and ADCP data to quantify the distribution of prey resources associated with marine mammal concentrations. 4. Conduct small boat operations to collect biopsy tissue samples from targeted marine mammal species and conduct close behavioral observations. This may include short-term deployment of tags to quantify dive behaviors. 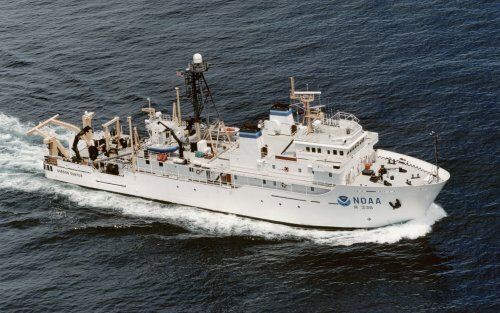 The NOAA Ship Gordon Gunter departed Pascagoula, Mississippi on 19 June 2006 to conduct a cetacean habitat survey in the U.S. Atlantic Ocean. The 60-day cruise was divided into a 19-day first leg, a 19-day second leg, and an 18-day third leg. During each leg, a broadscale survey of cetacean abundance and spatial distribution was conducted along standard survey tracklines using visual survey method. When concentrations of marine mammals were identified, the survey operations were shift to finescale survey tracklines designed to directly investigate the associations between marine mammals and mesoscale habitat features. These surveys included more intensive physical oceanographic sampling (e.g., CTD and XBT casts), zooplankton sampling using bongo nets, and visual and acoustic marine mammal survey effort. The small boat was launched on a daily basis, as weather and safety allowed, to collect biopsy samples, behavioral information, photo-identification data, and other information to quantify the movements of marine mammals in relationship to prey resources and physical features. Visual surveys for marine mammal abundance and spatial distribution were conducted aboard the Gunter. During broadscale surveys, visual surveys were conducted from the ship’s flying bridge. On the flying bridge, two observers were stationed at the port and starboard 25x “bigeye” binoculars and the third observer watched the track line with naked eye and small binoculars, and entered data into a laptop computer. On sighting marine mammals, the ship was asked to divert from the tackline to approach the group for species identification and group size counts. The small, two element acoustics array was deployed during broadscale or finescale surveys. This array was deployed and retrieved by hand during normal cruise operations. The array was linked by cable to recording equipment and data collection computers in the electronics lab as has been done in past surveys. Environmental data was collected from the suite of instruments integrated into the Scientific Computer System (SCS), which was in operation 24 hours/day. The continuous-flow thermosalinograph/ fluorometer was in use 24 hours/day. CTD casts up to 500 m were made at selected environmental sampling sites. XBT casts were made several times during each survey day. Additionally, the Acoustic Doppler Current Profiler (ADCP) and the fisheries acoustics (EK60) systems were used 24 hours/day. Additional biological sampling was conducted at many of the environmental stations. This included up to 80 bongo stations, collecting ichtyoplankton. 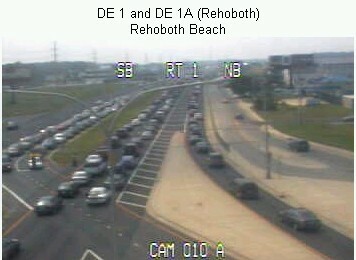 This is a view from the DelDOT traffic camera after three vehicles crashed in the northbound lanes of Route 1 north of the Rehoboth CVS just before 3 p.m. on Sunday. State police said over the radio that injuries did not appear to be serious. 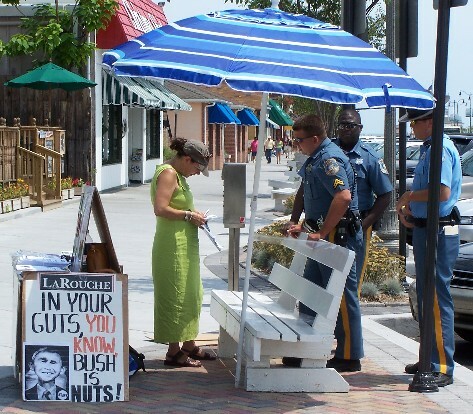 The man in the white shorts seemed surprised when half a dozen Rehoboth Beach police officers, firefighters and a lifeguard greeted him as he exited the surf at Maryland Avenue. Somebody saw him clinging to one of the beach patrol's orange buoys off of Baltimore Avenue around 6 p.m. Sunday, feared he was in distress, and called for help. He said he had no problem and swims on a regular basis.